Rumi is 14 years old and lives in rural Bangladesh. Each day on her way to school, she was being sexually harassed by older men. Her family was already struggling to pay her school fees, so the extra issue of the harassment pushed Rumi’s family to one day suddenly take her out of school and marry her off to a much older man. “When I found out that my parents were arranging my marriage, I felt like my life stopped. My dreams were shattered when I was taken out of school. I wasn’t ready to become a mother or a wife,” Rumi said. Before too long her classmates noticed she was missing, so they went to her house and spoke to Rumi’s father. They convinced him that it wasn’t right to take Rumi out of school and marry her off. They then went to the school principal, who agreed to waive Rumi’s school fees. Rumi (centre right) and her classmates. 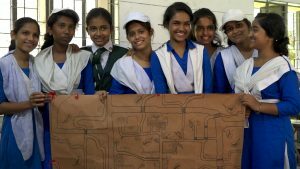 These girls were empowered and enabled to take these courageous actions through participating in The Hunger Project’s Safe School for Girls Program in Bangladesh. The Program has taught 30,000 young girls about their rights, and the negative impacts of child marriage. “Now I’m back in school, I am studying hard so that I can get into a good college. I dream of becoming a doctor. My classmates have made me feel courageous and I feel safe because of them. I no longer have to worry about child marriage,” Rumi said. Share the inspirational story with your friends on social media. Read about the positive impact The Hunger Project is having in Bangladesh. Join Unleashed Women and empower women and girls like Rumi through fundraising to stop child marriage and end hunger for everyone. Invest now with a one-off or monthly investment.